A flight of RAAF Avro Lincoln bombers overflying Singapore Naval Base, June 1953. Her Majesty's Naval Base, Singapore (also His Majesty's Naval Base, Singapore; HMNB Singapore), alternatively known as Singapore Naval Base, Sembawang Naval Base and HMS Sembawang, was situated in Sembawang at the northern tip of Singapore and was both a Royal Navy shore establishment and a cornerstone of British defence policy (the Singapore strategy) in the Far East between the World Wars. From 1921 to 1941 it was a sub-command of the China Station and from 1941 to 1958 it was sub-command of the Far East Fleet . 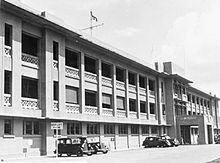 Singapore Naval Base, view of the Navy Office, which was the Headquarters of the Commander-in-Chief China Station and the Rear Admiral Malaya. Originally announced in 1923, the construction of the base proceeded slowly at Sembawang until the Japanese invasion of Manchuria in 1931. It was completed in 1938, at a staggering cost of £60 million – equivalent to £2½ billion in 2006. 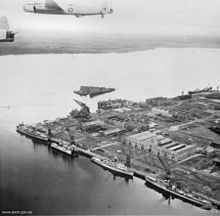 The base covered 21 square miles (54 km2) and had what was then the largest dry dock in the world, the third-largest floating dock, and enough fuel tanks to support the entire British Navy for six months. It was defended by heavy 15-inch naval guns stationed at Johore battery, Changi, and at Buona Vista Battery. Other important batteries of smaller calibre were located at Fort Siloso, Fort Canning, and Labrador. Air defence relied on the Royal Air Force airfields at RAF Tengah and RAF Sembawang. Winston Churchill touted it as the "Gibraltar of the East". The base was renamed from HMS Terror to HMS Sultan on 1 January 1940 to acknowledge the proximity of the nine Sultanates on the Malay peninsular. After the fall of Malaya on 31 January 1942, Singapore came within range of the artillery guns of Imperial Japanese Twenty-fifth Army positioned within sight of the base in Johor, which was poised to capture Singapore within 2 weeks. The base was subsequently captured, largely intact, by units of the advancing Japanese Army and remained in Japanese control through the end of World War II. With the surrender of Japan in August 1945, control of the naval base and Singapore was reverted to British and Commonwealth Forces in September 1945, when allied units of South East Asia Command under Lord Louis Mountbatten started to arrive in Singapore. In line with Royal Navy's tradition of naming their respective naval base and dockyard, the accommodation barracks adjacent to the base became known as HMS Terror (from 1945 to 1971) in honour of HMS Terror, an Erebus-class monitor armed with twin 15-inch guns, which was based at one time in Singapore before the war. Since 1972, part of the compound is now occupied by the Republic of Singapore Navy's Naval Diving Unit (NDU). The troopship RMS Queen Mary in Singapore Graving Dock, August 1940. 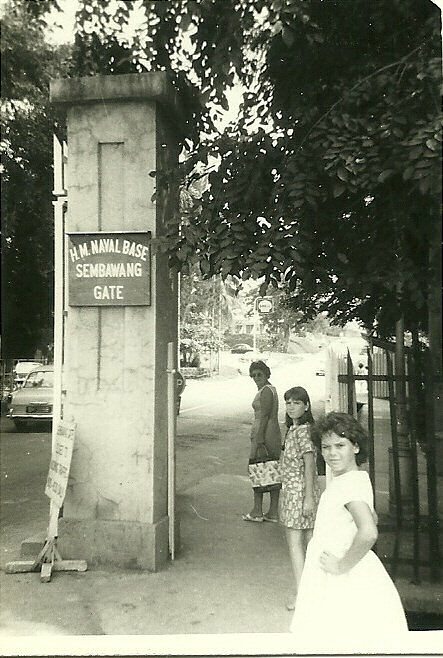 With the complete withdrawal of British forces from Singapore in 1971, the Naval Base has since been handed over to the Singapore government, which in 1968 converted it into a commercial dockyard (as Sembawang Shipyard, now part of Singapore Exchange-listed SembCorp Marine). After the short term ANZUK arrangement was terminated (started in 1971 and ended in 1974), New Zealand Force South East Asia (NZFORSEA) was created with the HQ being sited at the Stores Basin area adjacent to the current Sembawang Naval Basin. NZFORSEA consisted of 1 Royal New Zealand Infantry Regiment (RNZIR), which was based at Dieppe Barracks near Yishun New Town, No. 141 Flight of Royal New Zealand Air Force (RNZAF), with its Bell UH-1D/H Hueys based at Sembawang Air Base and frequent deployments of Royal New Zealand Navy (RNZN) frigates. This was the last major foreign military presence based in Singapore. Total military strength at the time stood at 850 with some 700 dependents. Under the auspices of the Five Power Defence Arrangements (FPDA), NZFORSEA took over the Royal Navy married quarters and billets, while the Installations Auxiliary Police Force (IAPF) was formed, the small police force was staffed by Singaporeans but commanded by an NZ officer to provide security to the whole area. This security blanket covered the British, UK and Australian facilities and personnel. When NZFORSEA withdrew from Singapore in 1989, it was replaced by the smaller NZ Defence Support Unit, the South East Asia (NZDSU SEA), with the IAPF still providing security to other nations including the US facilities and personnel. However, the British Ministry of Defence (MoD) continues to maintain a small logistics base at Sembawang wharf to control most of the foreign military activities there, which includes repair, refuel and resupply for ships of the Australian, British and New Zealand navies as well as those from other Commonwealth countries under the auspices of FPDA. As part of a 1990 agreement (concluded in 1992) between Singapore and the United States, American military forces (primarily naval and air force) have been making use of Sembawang's base facilities. The Task Force 73/Commander, Logistics Group Western Pacific has been headquartered in Sembawang since 1992, providing logistic support for the US 7th Fleet in its operations in the Pacific and Southeast Asia. Apart from the US naval presence, the United States Air Force has its administration, logistics and support component for the 497th Combat Training Squadron being based there, while the squadron's flight operations are based out of Paya Lebar Air Base. 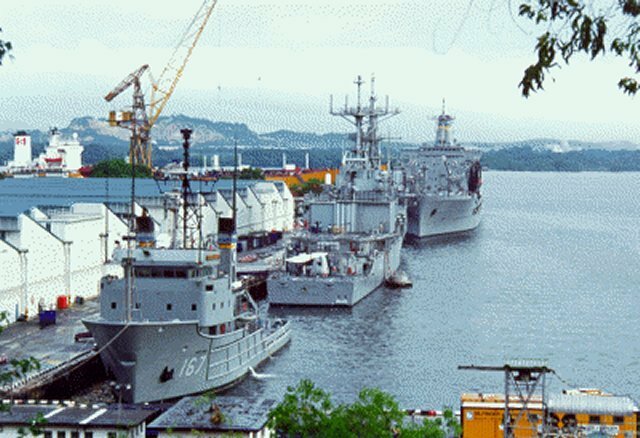 Since 2002, Singapore has granted the Indian Navy in principle access to Sembawang Port and Indian patrol boats escorting American Naval ships through the straits of Malacca. A large floating dry dock, the third-largest in the world at the time of its construction, was located at the base. It was used by the aircraft carrier, HMS Eagle, for a refit in 1939. At the time, the dry dock was described as having been floated from England to Singapore 10 years before. The graving dock was completed in February 1938 and was more than 300 meters in length and was the largest dry dock in the world at the time. With the impending capture of Singapore by the Imperial Japanese Army in 1942, the dry dock gates were blown off and machinery destroyed. 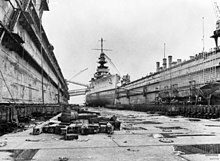 The dock was subsequently repaired and used throughout the war and was subjected to Allied air attacks to disable the dry dock in late 1944 and early 1945. Modern sources give the title "Captain-in-Charge" to the senior officer at Singapore Naval Base from 1921 to 1942, including flag officers. However, contemporary sources state that the official title wasn't granted until 1931, when Captain Birkett took on the role. ^ "Naval Base Becomes H.M.S. Sultan". The Straits Times. Singapore. 31 December 1939. p. 9. ^ "George Bush: The President's News Conference With Prime Minister Goh in Singapore". Public Papers of the presidents. The American Presidency Project. 4 January 1992. Retrieved 2 June 2011. ^ "Commander, Logistics Group Western Pacific". United States Embassy to Singapore. Archived from the original on 4 July 2011. Retrieved 7 July 2011. ^ "Navy Region Center Singapore (NRCS)". United States Embassy to Singapore. Archived from the original on 4 July 2011. Retrieved 7 July 2011. ^ "497th Combat Training Squadron (497th CTS)". United States Embassy to Singapore. Archived from the original on 26 July 2011. Retrieved 7 July 2011. ^ Mukherjee, Anit (28 October 2015). The Merlion and the Ashoka: Singapore-India Strategic Ties. ISBN 9789814704670. ^ "Eagle To Go In Floating Dock". The Singapore Free Press and Mercantile Advertiser. Singapore. 26 April 1939. p. 9. ^ a b c Mackie, Colin. "Royal Navy Senior Appointments from 1865" (PDF). gulabin.com. Colin Mackie, June 2018, p.179. Retrieved 10 June 2018. ^ a b "Base ship at Singapore; Capt. Mark-Wardlaw to command". Sunday Tribune. Singapore. 2 September 1934. p. 1. ^ a b "Capt. M. L. Clarke; Official welcome this afternoon". The Straits Times. Singapore. 11 September 1936. p. 12. ^ "Commodore Drew due on Friday". Malaya Tribune. Singapore. 16 November 1938. p. 12. ^ a b "Commodore T.B. Drew Promoted To Rear-Admiral". The Singapore Free Press and Mercantile Advertiser. Singapore. 2 August 1939. p. 3. ^ ""S'pore itself match for anybody" Rear-Admiral Drew says goodbye to Malaya". Malaya Tribune. Singapore. 2 September 1941. p. 3. ^ "Admiral Spooner In Singapore". The Straits Times. Singapore. 22 August 1941. p. 10. Morris, James. Farewell the Trumpets. Penguin Books, 1979.